Thank you for considering the help and support of Traditional Chinese Medicine during your journey through what can become a maize to conception. It is my belief and experience that Traditional Chinese Medicine, in particular Dietary Therapy and Acupuncture, is an ancient science that can help families like your own move through this maize with ease. There is an excellent resource for individuals who wish to become pregnant that explains how Traditional Chinese Medicine works. The book is called: The Infertility Cure by Radine Lewis. Whether you are currently working with a team of specialists or are looking for a more natural approach, I strongly recommend that you read this book. 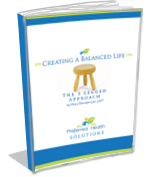 The insights into how to create balance in your body so that conception can occur are plentiful. If you already have a team of specialists currently working on your behalf, Acupuncture is a great integrative approach to enhancing your care. Traditional Chinese Medicine/Dietary Therapy/Acupuncture is about keeping you in a healthy balance so that your body can do, with the least amount of stress, what it needs to do in order to conceive. Sometimes the infertility process can create quite a bit of stress on the body because of the number of hormones that are given. With the support provided here at Preferred Health Solutions you can be reassured that the process will be much more comfortable. A number of patients who first used traditional infertility treatments (in vitro or IVF) were unsuccessful. However, with the addition of acupuncture their second try found success. If you are wishing to take a more holistic approach and are looking for a natural support then Traditional Chinese Medicine is an excellent place to begin. Even before the first appointment I strongly recommend reading the book The Infertility Cure by Radine Lewis. This will better enable you to understand the process which we would be embarking upon. Results, of course, are different for many. For some it was just a matter of a couple of treatments and others longer. The goal is always to help restore your natural balance so that your body can do what it knows how to do. Preferred Health Solutions is here to support you in your journey to conception. Please feel free to call or email me with your questions or concerns. For those doing the Medical path please note that the office is also conveniently located down the street from many of the Infertility Clinics. I am looking forward to becoming your personal health coach as we restore your health and balance so your dream of extending your family is a dream come true.